Howard Stern would be a great host for SNL. One of the great things about Saturday Night Live is the variety of stars who host the show each week. Frankly, some of the hosts aren't cut out to do sketch comedy, which can really affect the flow of the show. That's why the producers often bring back certain hosts who have a proven track record for doing great sketch comedy, like Steve Martin, Alec Baldwin, Justin Timberlake, and Tom Hanks. Each of them seem to host at least once a year because they hit it out of the park every time they host. Do you remember the Howard Stern Channel 9 TV Show? Howard Stern's local TV show often beat Saturday Night Live in the ratings, but it's NEVER been on home video. which means there is an entire generation of his current fans that weren't even born when it first ran. That's pretty strange when you think of it. Considering how popular the show was, you would think the producers of the show would bend over backwards to release the show on DVD, and digital streaming services like Netflix, Hulu, and Vudu. Clearly it would be a huge hit and earn quite a lot of money, so what's the problem? 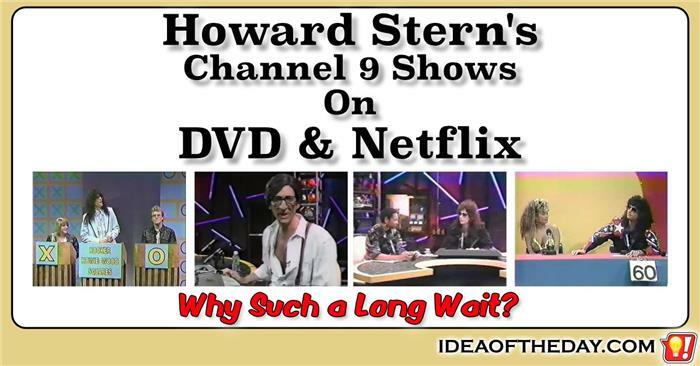 Why hasn't Howard Stern's Channel 9 TV shows been released on DVD and Netflix? Back in 1990, when Saturday Night Live was struggling for ratings, Howard Stern's produced a TV show from New York's Channel 9 (WWOR). It started out as a local show, but the ratings were so strong that it was syndicated nationwide within a few months. To say it was a ratings success is an understatement. In the New York area, the audience was twice as large as NBC's Saturday Night Live. In Los Angeles, he had a whopping 34% share of males in the 18-49 demographic.